What's this flying towards the Redmond fans? A senior Microsoft exec has courted controversy by appearing to suggest that computers infected with malware should be 'quarantined' from the internet. As outlined in a post on Microsoft's 'on the issues' blog corporate vice president Scott Charney talks about the huge threat of botnets and the threat that infected computers hold for other users. But Charney goes further by suggesting that an infected computer should be quarantined – a stance that has already led to a huge surge of adverse publicity and anger. "Just as when an individual who is not vaccinated puts others' health at risk, computers that are not protected or have been compromised with a bot put others at risk and pose a greater threat to society," said Charney. "In the physical world, international, national, and local health organizations identify, track and control the spread of disease which can include, where necessary, quarantining people to avoid the infection of others. "Simply put, we need to improve and maintain the health of consumer devices connected to the Internet in order to avoid greater societal risk. "To realize this vision, there are steps that can be taken by governments, the IT industry, Internet access providers, users and others to evaluate the health of consumer devices before granting them unfettered access to the Internet or other critical resources." The backlash against this has been speedy – with commenters on the blog itself quick to condemn. "So the government knows best?" asks one poster. "Which government? It is bad enough having to find ways to get around suppressive governments ISPs anyway. "…Do you trust every single poor country to implement and what happens if one does not?" 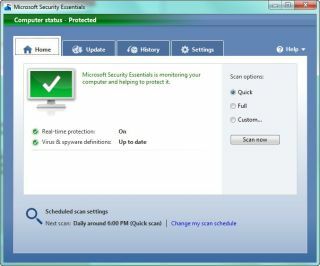 This kind of thing is always going to be a contentious issue, and Microsoft may well find that placing itself at the heart of such controversy is less effective than its much better-received decision to release the free and effective Security Essentials anti-virus package.